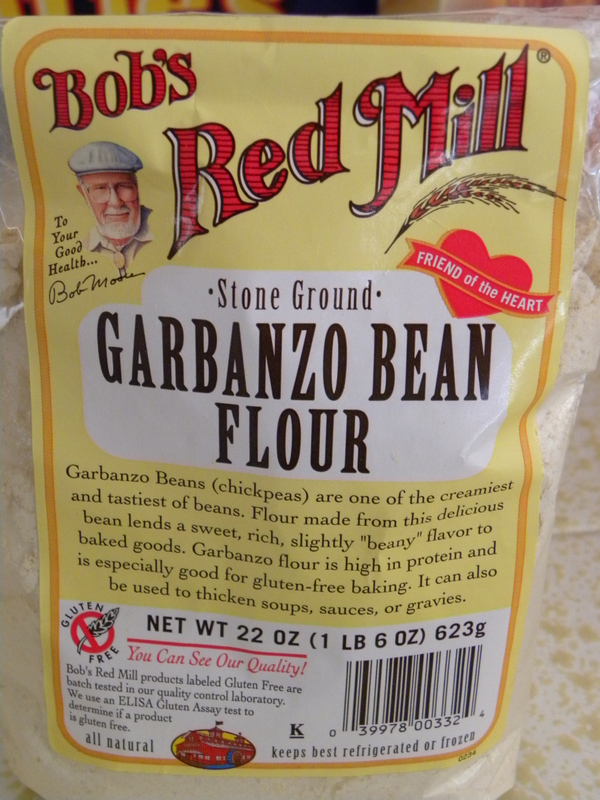 Bob's Red Mill makes garbanzo bean flour. I first heard of farinata when Vic and I went to the Bracebridge Christmas dinner at the Ahwahnee Hotel (a once-in-a-lifetime experience at the prices they charge) two years ago. Farinata is a cracker or bread-like appetizer, made with garbanzo bean flour and often flavored with sage and onion. I vowed to try making it myself. My first effort, using a recipe from Sunset Magazine online, wasn’t very successful. The recipe called for 1 cup of garbanzo bean flour and 1.5 cups of water, plus 2 T olive oil, 1/4 C sage, and 1 onion. The recipe also called for 1/4 tsp salt, which wasn’t enough. 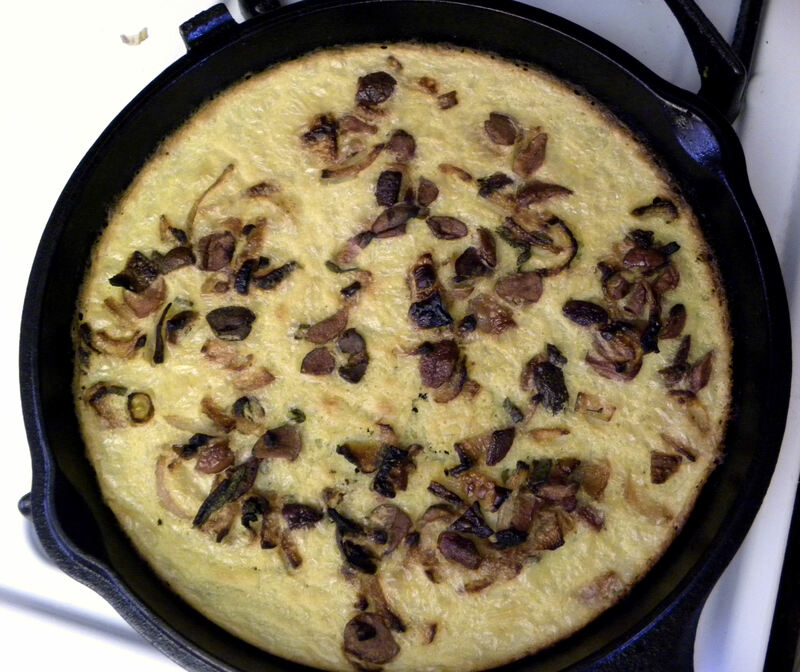 I cooked that farinata in a cast iron skillet on the stovetop as suggested, followed by broiling. It came out gooey and stuck to the pan even though I cooked it longer than suggested. I gave up on that recipe. Then I came across a recipe for farinata with sage, olives and onion on www.epicurious.com that was from the Oct. 1999 issue of Gourmet magazine. I tried it and was very impressed. The only fault I found with the recipe was that it was way too salty. It called for 1 1/4 tsp salt plus 30 Nicoise olives. I didn’t have Nicoise olives, so I used Kalamata, but had only half the amount the recipe called for. I think that half was a good amount. My sage hadn’t grown enough to give me the 45 small leaves that the recipe called for, so I used 15 leaves. It would have been better with double the amount of sage I used. Next time. Here is the Gourmet recipe and instructions. Set a pizza stone on the rack in the upper third of the oven and preheat to 550 degrees F. (That’s not a misprint, 550). While oven is preheating, whisk together the garbanzo bean flour and water until smooth. Batter will be very thin and watery. Whisk in salt and 2 T of olive oil (I did measure the oil for this step). Let batter sit. (I have no idea why it should sit unless the flour needs to rehydrate. Cook onion with salt to taste (no added salt is necessary since salt is in the batter and the olives) in 1 T olive oil in a large, heavy skillet over moderate heat, stirring occasionally, until onions are golden, about 10 minutes. Then cool. Put a seasoned 10-inch cast iron round griddle (I used the lid to my Lodge cast iron Dutch oven, which was perfect) on pizza stone and heat 10 minutes. ( I put the griddle on the stone while oven was preheating.) Remove pan from oven and add 1/2 T olive oil (I didn’t bother measuring), tilting to coat evenly. Working quickly, stir batter and ladle about 7/8 C evenly into pan. Batter will sizzle and begin to set immediately. 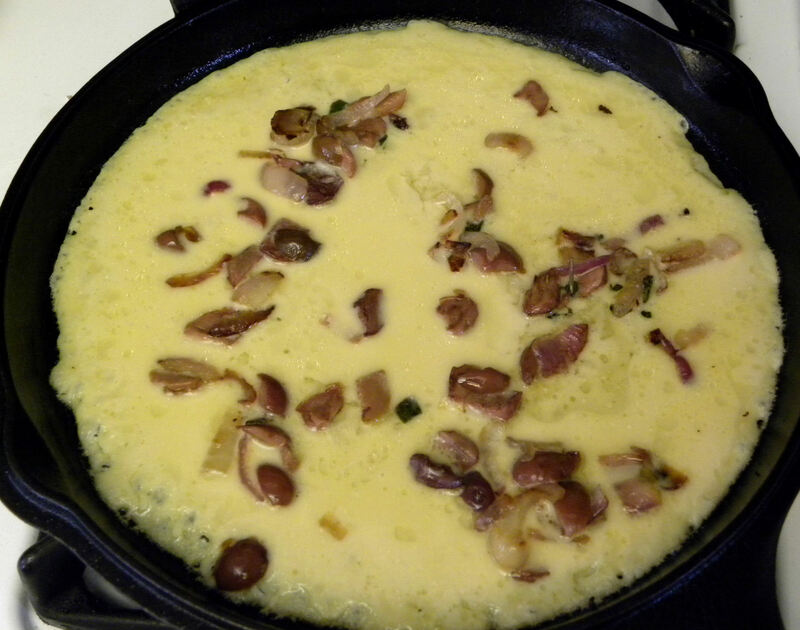 Quickly scatter a third of the onion, olives and sage leaves over the batter. Farinata batter is thin and watery, but begins to cook and set the instant it hits the preheated griddle. Return pan to oven on top of the pizza stone. Bake for 12 minutes at 550 F, then turn oven to broil (if oven has a top broiler) and cook for an additional 1-5 minutes. Edges should be golden brown and crisp and the top flecked with golden spots. (If using an oven with a broiler on the bottom, bake 15 minutes then transfer pan to broiler and broil for 1-2 minutes). Cooked farinata will have crisp edges and golden flecks on the top. Slide farinata out of the griddle and onto a cutting board. Cut into 6 pie-shaped wedges. Make two more farinatas, reheating pan for 5 minutes before adding batter. Serves 4-6 people as an appetizer. It’s nice to share a bottle of wine while waiting for the next farinata to cook. Because of the length of time until the next one is ready, you might have other appetizers or an antipasto available. 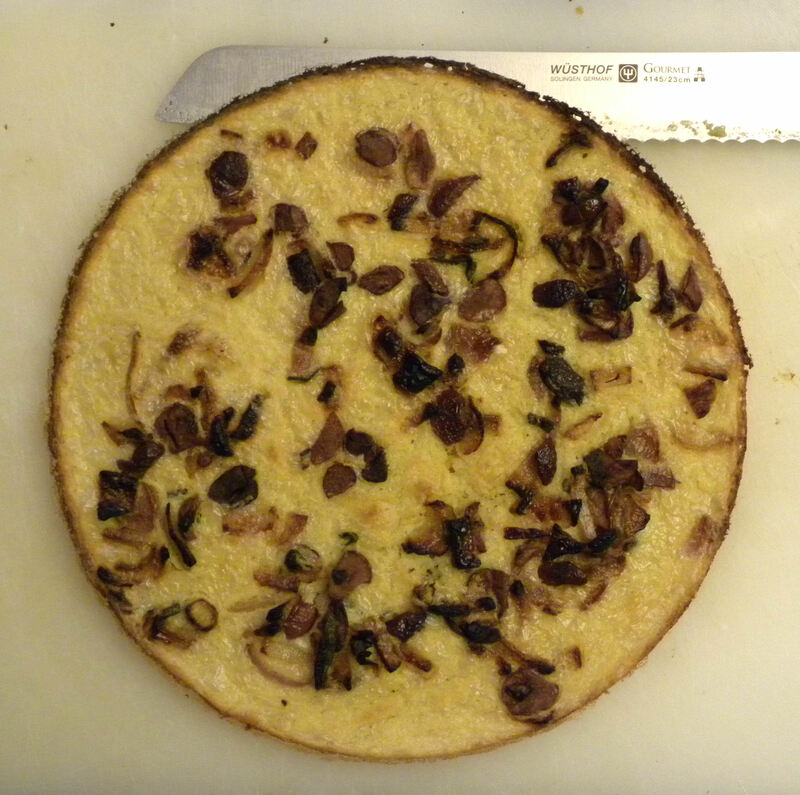 A finished farinata. This recipe makes three 10" farinatas, which is supposed to serve 6 people, but my husband and I gobbled it all up ourselves, along with a salad. That was dinner. YUM! This is just one more reason to grow an herb garden. I love having fresh herbs available right outside the door when I want to experiment with a new recipe. This entry was posted in Uncategorized and tagged appetizer, farinata, herb garden, olive, onion, photos, recipe, sage. Bookmark the permalink. Hi Nate, thanks for the tip on using mushrooms in a farinata. I’ll give that a try next time I make a batch.